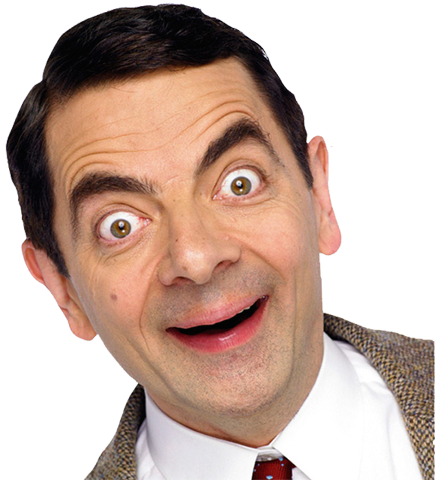 Mr Bean walks past a saxophone playing busker and wants to drop him some change. Finding he has no change, he does an impromptu dance to the music and a man leaves him a coin. Bean then donates it to the saxophone player. 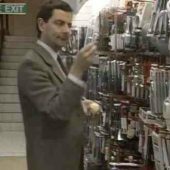 Bean goes to a department store to try out his new credit card. He tries everything out before buying including a toothbrush, towel, a peeler and a frying pan. He also chooses a live telephone to purchase on the receptionist’s desk. At the register, his credit card gets mixed up with another man’s, so he pick-pockets the man to get it back. 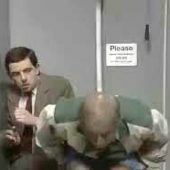 Unfortunately, his hand gets stuck and the man ends up inadvertently pulling Mr Bean all the way to the gents toilets. It’s Bean’s birthday, so he goes to a restaurant. 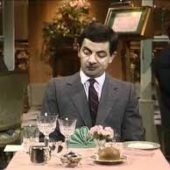 He orders a steak tartare expecting it to be like a normal steak, but Bean is disgusted by its taste and appearance. 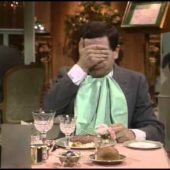 He decides to cut it up and hide it, but the chaos he causes leads to the maitre’d seating him at another table and getting him another steak tartare. Now all eyes are on him to see him finish it. 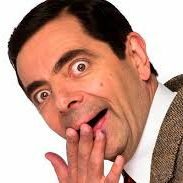 Mr Bean waits in line after a royal premiere at the Odeon Leicester Square to meet the Queen ( why Bean has been chosen is never revealed. ) Unfortunately, he finds that his breath smells, his nails and teeth are dirty and his shoes are grubby. He manages to rectify these by using his customary inventiveness ( spit to polish his shoes, a loose thread to floss his teeth, and a postcard to use as a handkerchief ) just in time to meet Queen Elizabeth. Preparing to bow, he accidentally headbutts her. She falls to the ground and Bean makes a run for it in the melee. 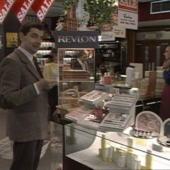 Mr Bean nearly suffocates walking through the perfume department and ends up on his knees. Bean tries out a toothbrush and then puts it back. Bean brings a potato with him to try out a potato peeler. Bean sizes up a frying pan by taking out a fish and seeing if it will fit. In the restaurant, Bean plays out the tune happy birthday on some glasses. Bean sends himself a birthday card. 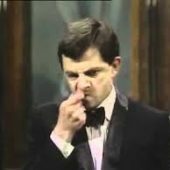 He repeats this in the episode Merry Christmas, Mr Bean when he sends himself a Christmas card. Maitre’d: Have you decided sir? waiter: Would you like to try the house wine? Bean: No no no…I’m driving. 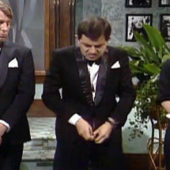 Matilda Ziegler, who plays Bean’s girlfriend in later episodes, appears as an usherette in the scene at the royal premiere. Rowan Atkinson does the voice-over at the royal premiere. In the restaurant ( allegedly a posh one ) one of the waiters pours wine into a large glass that is usually meant for water. 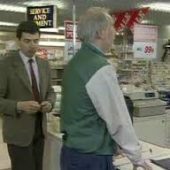 When Bean takes out his new American Express Credit card, the name printed on it is “nm1578405 Thames TV PLC.” The card belonged to the Production Assistant.